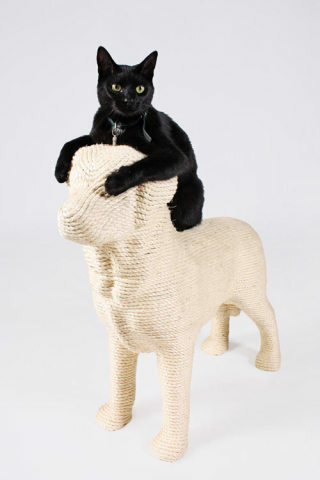 The Best Cat Scratching Post EVER! There's not much humor in a cat scratcher; that is, unless you're looking at Dog Scratchpost, the cat scratcher by Dutch designer, Erik Stehmann. 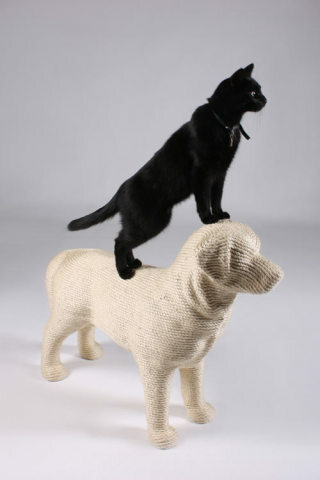 Oh yes, it's a beautifully sisal-wrapped silhouette of a strong, proud dog, and doesn't it capture the irony of cat v. dog? Stehmann writes of his design that it "gives cats the opportunity to take out their aggression on their natural enemy!" If you can afford the Dog Scratchpost, there's a rule that it must be kept in the center of your living area for all who love cats and dogs to see! If you can't afford the Dog Scratchpost, perhaps these cute but affordable scratchposts will have to do. Maru. The Cutest Cat in the World? Maybe... In the Animal Video of the Day!! !